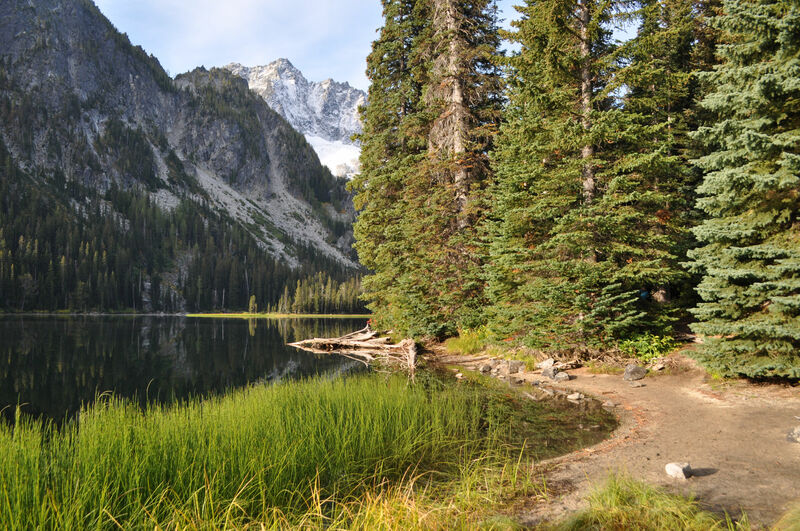 You are currently browsing the tag archive for the ‘Alpine Lakes Wilderness’ tag. 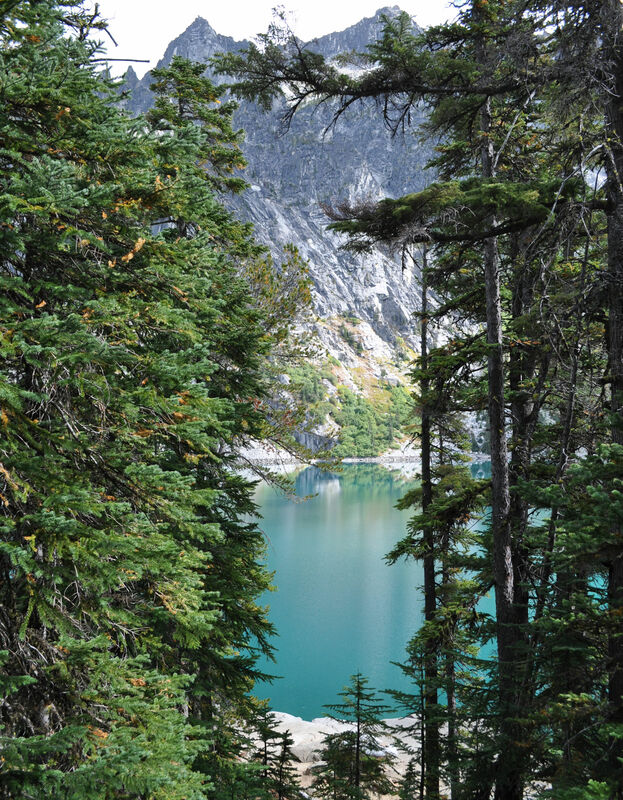 Colchuck Lake in the Alpine Lakes Wilderness of Washington state. Aasgard Pass is to the left of Dragontail Peak. 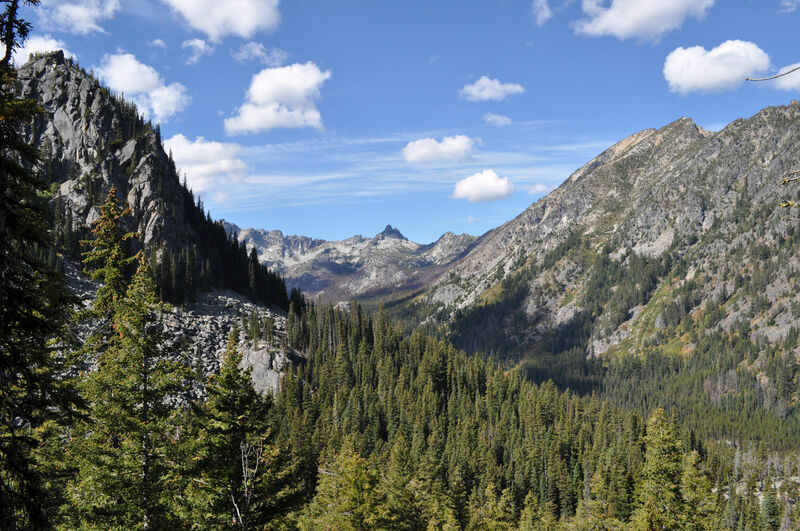 Colchuck Glacier is to the right. 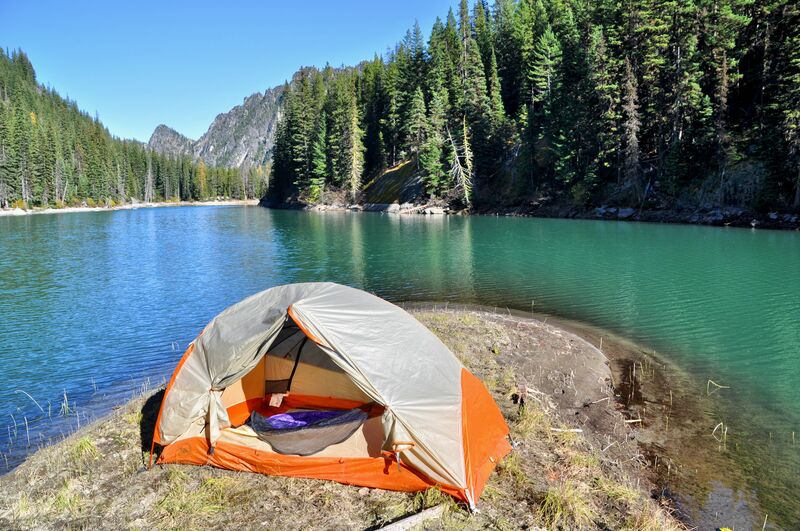 I slept very well in my tent and woke up refreshed and eager to get along the trail. First though: freshly brewed Peets coffee. The Sulawesi-Kalosi is my favourite. The trail to Colchuck Lake required some backtracking about 2.3 miles to the trail junction, then another 2 miles uphill. The climb is apparently 615 feet and is very steep in places. 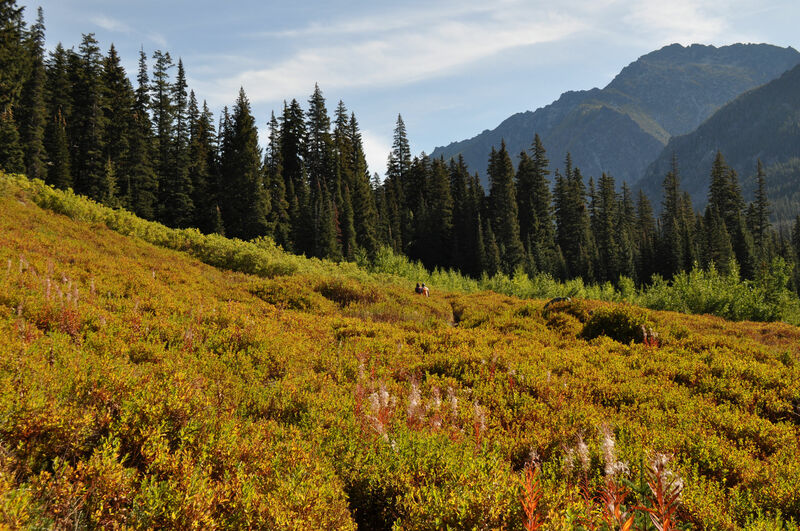 Washington Trails Association was there in 2017 and did some great work on the trail. While they did not make the climb any less steep, they made it easy to follow, and stable, putting in many many granite boulder “steps,” for example. These two had also camped at Stuart Lake with me. “We only have passes for the Stuart Zone,” I heard multiple times from hikers. It was true for me as well. We are headed for the valley between the two hills on the right. 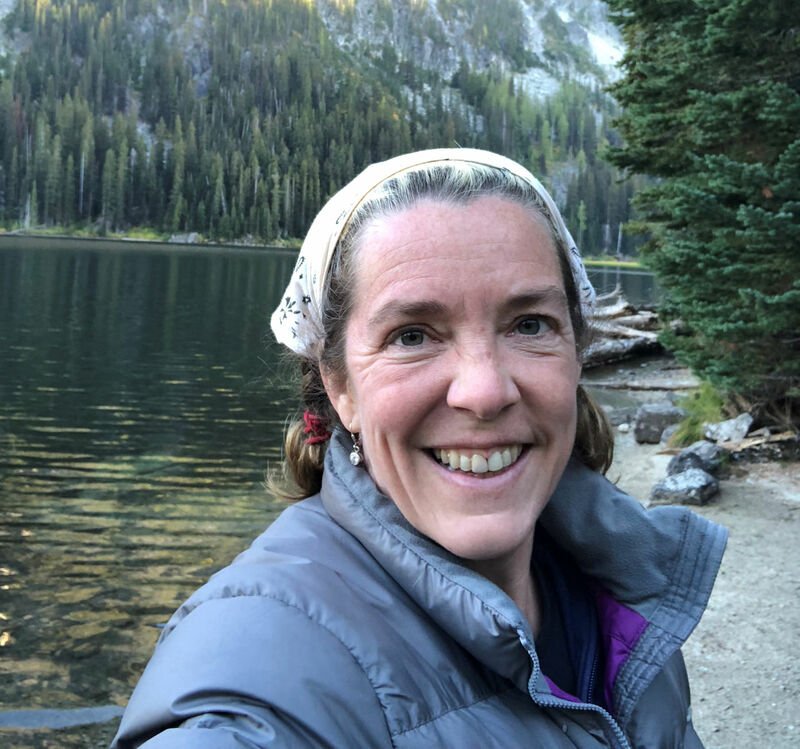 Me, along the Colchuck Trail. From this vista point, I could see the valley where Lake Stuart lies. Can you see the brown burned trees? (click the image for a larger version) Those are on the slope above my tent. The hill above my camp shows signs of wildfire. So glad it didn’t burn down to the water’s edge…but I wish I didn’t see so much fire sign when I hike. I climbed up, up, over roots, around boulders, across streams. I stopped to gasp periodically, while I waited for my heartbeat to slow down again to something near normal. There weren’t any meadow landscapes like the Lake Stuart trail, just climbing the granite stairs to the top. And then… wow! 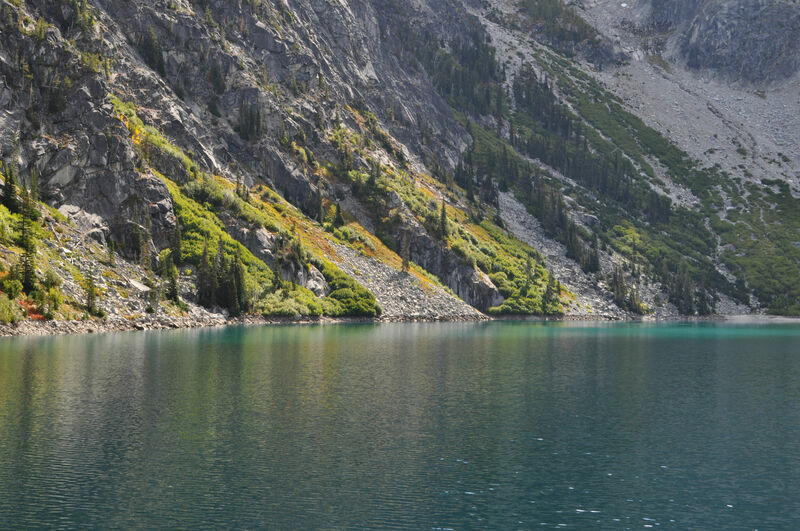 The jaw-dropping blue of Colchuck Lake hit me. I describe the colour as a mixture of aqua and tuquoise, and a wholly unanticipated hue in the landscape of predictable green trees and blue skies. This was my very first glimpse of the lake. It stopped me in my tracks and I took a photo from right there. I must have taken two dozen photos, trying to get my camera to show you the colour I saw. This comes close, but nothing is like it was to be there. I made a beeline for the lake and found the first of many many beautiful white smooth granite boulders that line the shores. After eating ALL the snacks I brought, and drinking a lot more water, I felt restored, and ready to explore. 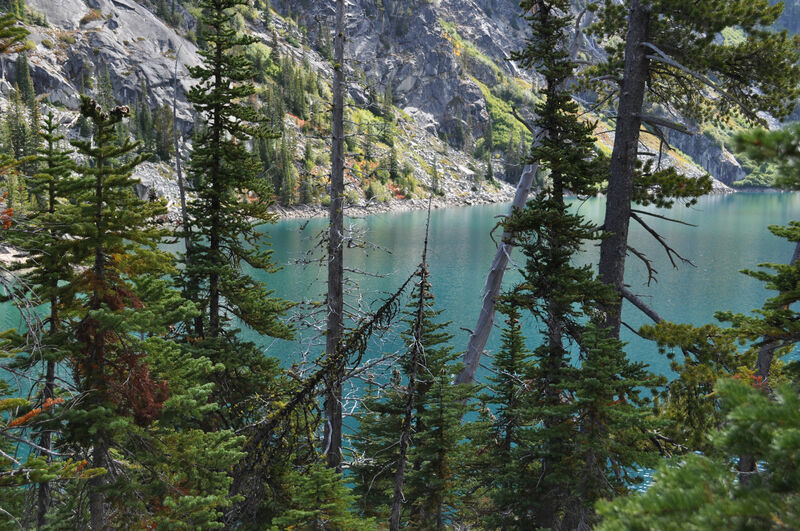 Colchuck Lake is larger than Lake Stuart and I easily spent two hours following the trail on the Western shore, taking tons of detours to the beach, or to the multitudinous smooth boulders that are excellent for sitting on to relax in the sun and stare in awe at the colour of that water. 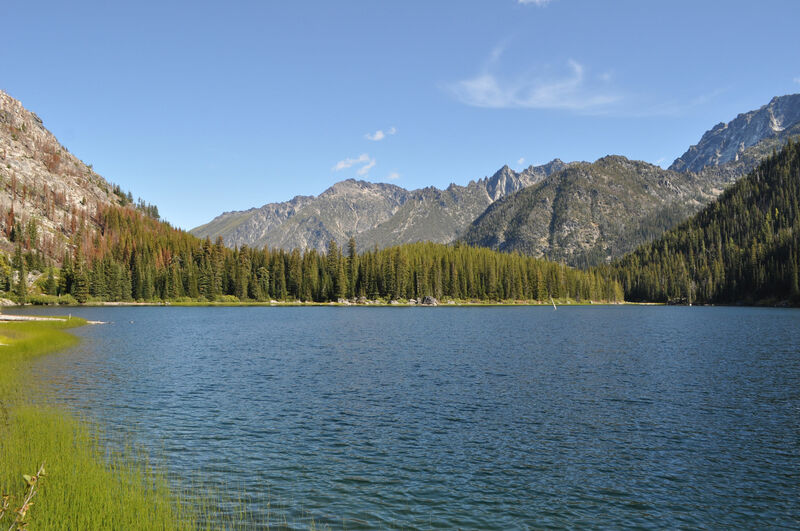 This lake has many more great viewing spots than Lake Stuart, and due to its size, there are more campsites. 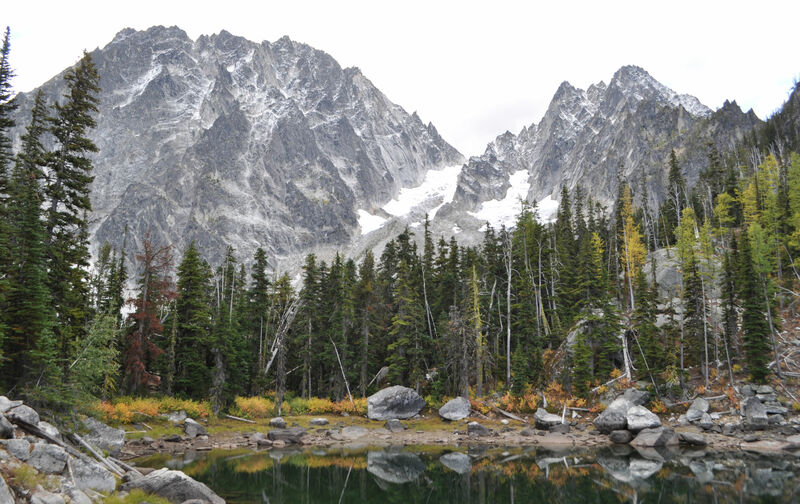 Next year I am for sure going to try to get an overnight pass for the Colchuck Zone. 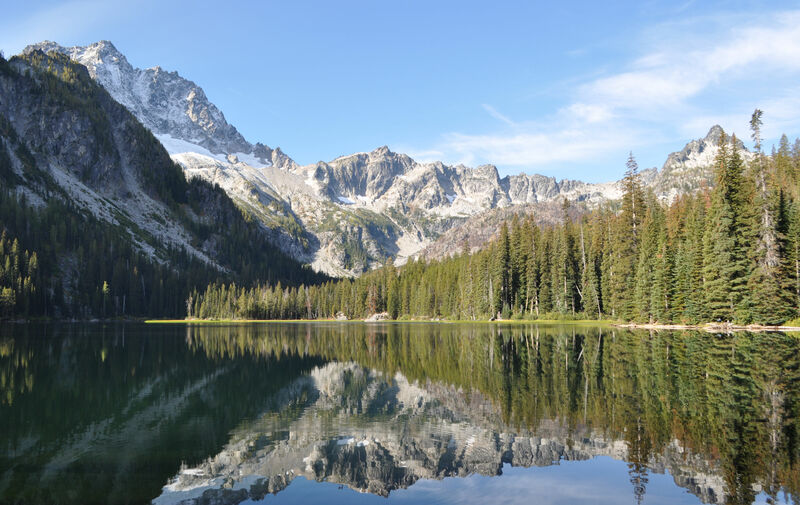 For anyone who is unfamiliar with The Enchantments in Washington, its beauty and proximity to Seattle make it a very popular place for backpackers and campers. So many people enter the wilderness that the area was getting destroyed from the many trampling human feet. There are now rules in place to control the humans. An unlimited number of people are allowed to walk through on the trails, but the number of people allowed to camp overnight is limited. The passes are disseminated via a lottery. It was cloudy while I visited the lake, but periodically a sunbeam would burst through and light something up. 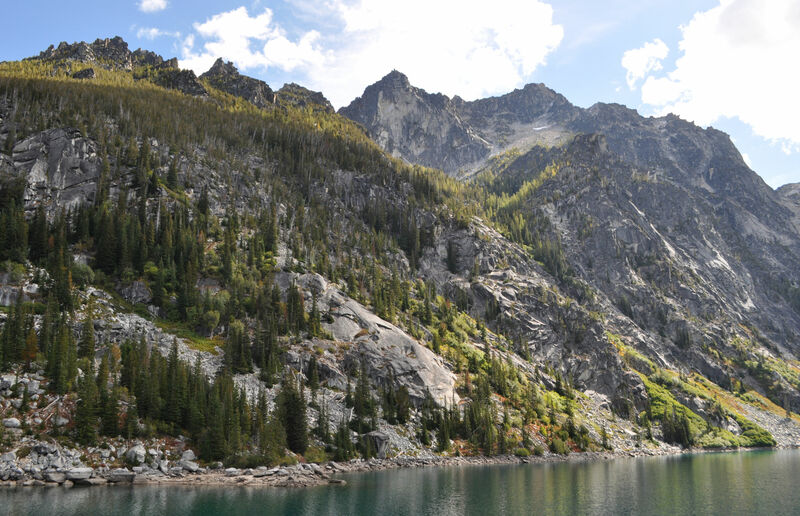 Looking south from Colchuck Lake. I explored several beautiful beaches on my way around the lake. A tiny adjacent lake that is unnamed. 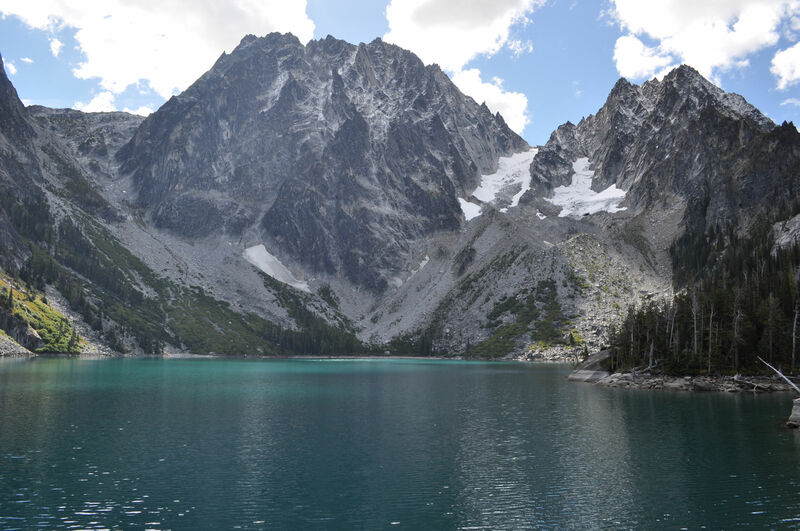 Perhaps during high water it is part of Colchuck Lake. I had heard of the famous Aasgard Pass, and I wanted to find it and hopefully spot Thor, or Odin. No, not really. 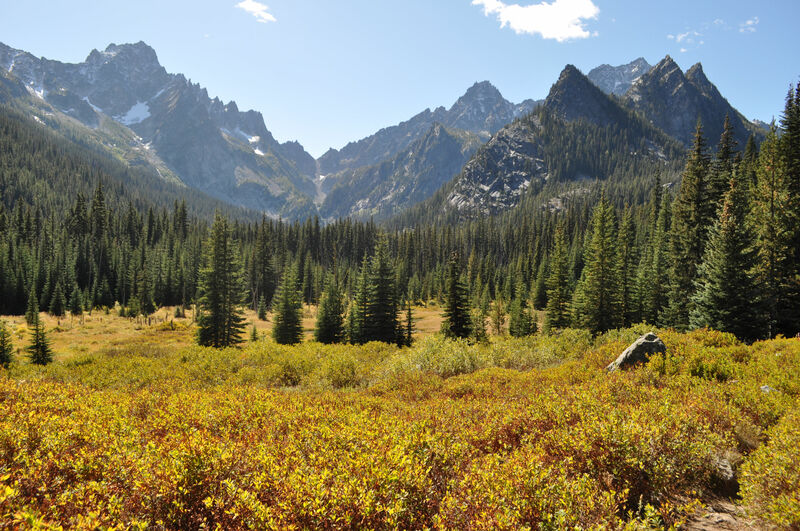 Aasgard Pass is the gateway to the Core Enchantments area from the west side. I have always entered from the east side, and never made it as far as the pass. So I just wanted to get a look at it and see how I felt about trying to climb it with a full pack one day, if I should ever have that option. 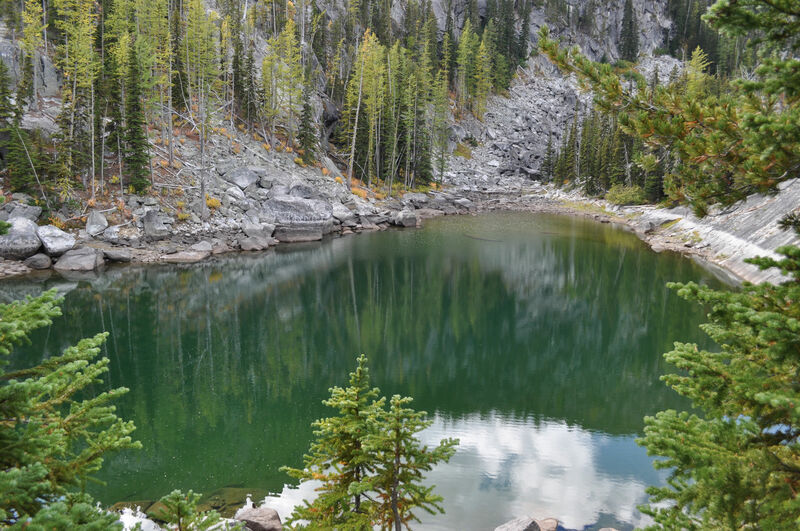 At the southernmost end of the lake is a large boulder field, and the trail crosses this, as I could tell from the cairns. I climbed across half of it, still trying to get a sense of which saddle hikers climb: the one with the glacier, or the ones to the right or the left of the glacier. I couldn’t tell by looking, and the boulders were a challenging scramble for merely trying to find a trail, just to turn around and come back. 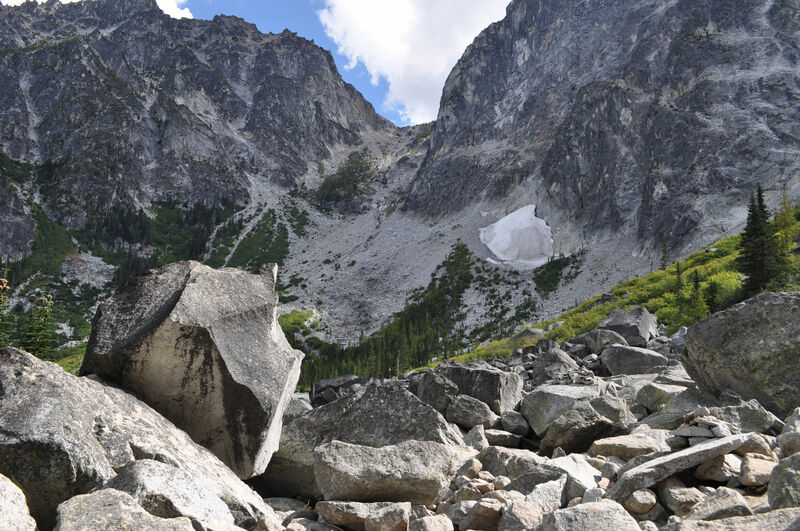 In any case, I had my answer: the boulder field was hard enough with only a day pack. 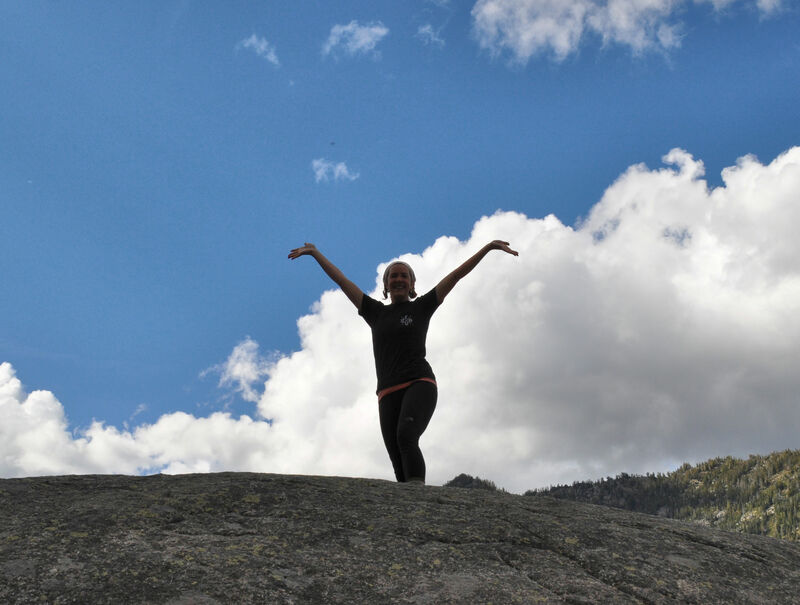 I did not have any trouble this day, but there were times when I had to balance on a toe and leap to the next rock. That sort of thing is much trickier with 50 pounds on your back, messing up your center of gravity. I found out later that Aasgard Pass was this one, directly ahead of me as I climbed over the boulders. Can you spot the cairns? 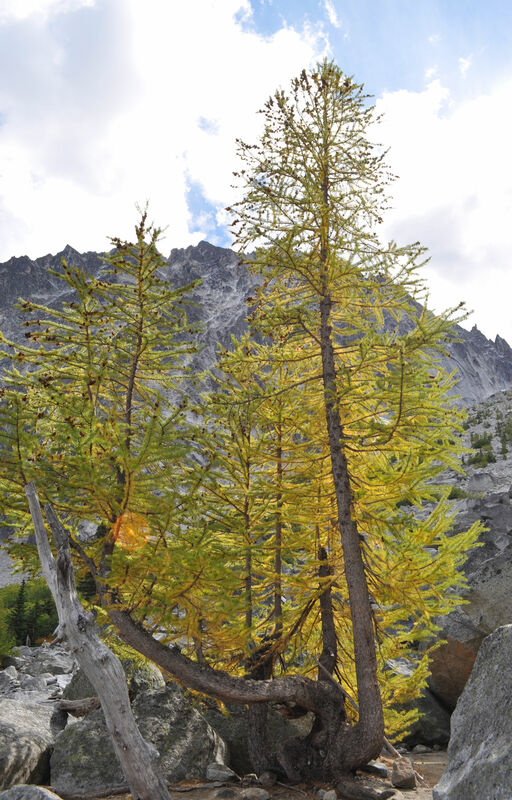 This beautiful Tamarack is along the boulder scramble to Aasgard Pass. I caught it just before the needles turned yellow for the season. 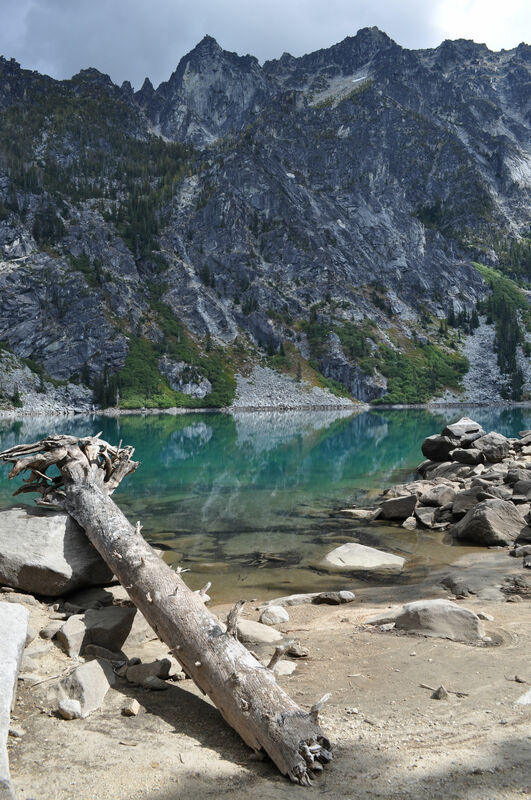 Looking north at Colchuck Lake. 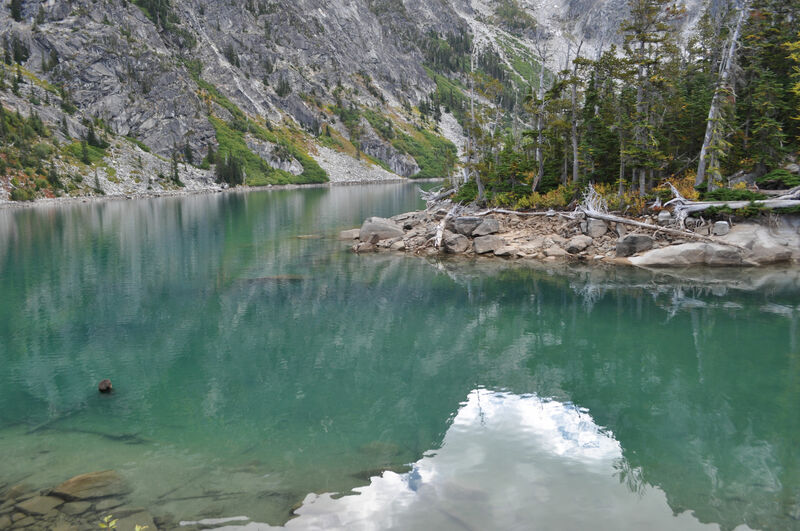 The tiny lake next to Colchuck Lake. At the tiny lake, the water is more green than aqua. And a group of Tamaracks on the slope are getting ready to turn yellow. It was afternoon and I was ready to head back down the trail to my camp. My knees fiercly grumbled about going down granite steps and over roots for a mile, or however long it is. But as I descended, the skies cleared and the weather stayed warm and lovely. I talked to so many lovely people on the trail, who eagerly told me where they came from, where they were staying (most of the people were day hikers only, with no overnight passes), and what their plans were. Curiously, people along the trail trust each other. Perhaps beause of the shared experience. Oh! Can I tell you the funnest human-related discovery of my whole hike?! Women! Women outnumbered the men far and away. It is the first time I have ever seen this on a backpacking trip. I must have passed around 100 people in three days, and at least 60 of them were women, though I wonder if it was closer to 70. Groups of women in their 20s, pairs of women in their 70s, solo women, women and men hiking together. I love them all for making this an activity for everyone. I want my people back home to stop freaking out whenever I say I’m going into the wilderness for a few days. The 60-something woman camping next to me on the beach said she had hiked the previous month with her husband. “Oh, he couldn’t make this trip?” I asked. “I told him I wanted peace and quiet and to read my book,” she replied. Ha ha ha!! High-five lady! This is happy, tired me, with a bit of a sunburn. Waiting for water to boil so I can have supper. Skies remained gorgeous all evening and I sat on the beach and watched the sun go down till I couldn’t keep my eyes open anymore. I boiled angel hair pasta (quicker than spaghetti), then mixed in a raw egg from the Hussies. Added pre-cooked bacon and carmelized onions and then dumped in grape tomatoes from my garden, parmesan cheese, salt and pepper. Viola! 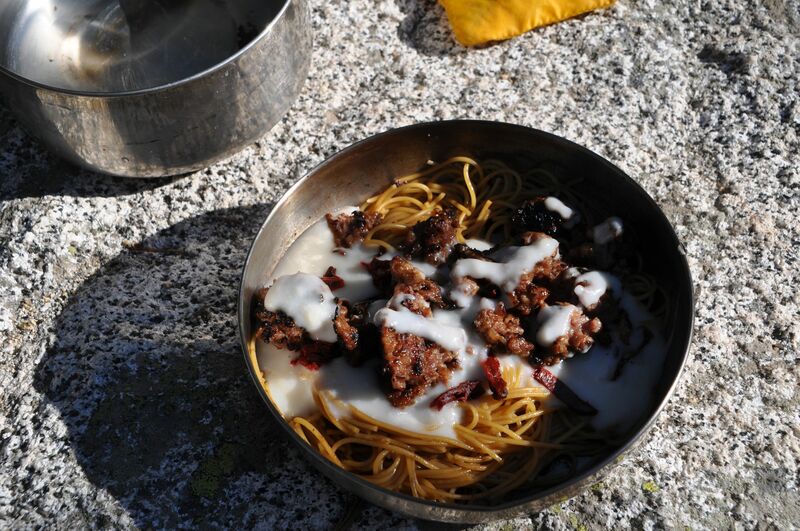 Spaghetti carbonara mountain-style. A metal mug of white wine went with it perfectly. Lake Stuart from the little beach at my campsite. Mt. Stuart (9415′) is the peak in the background. 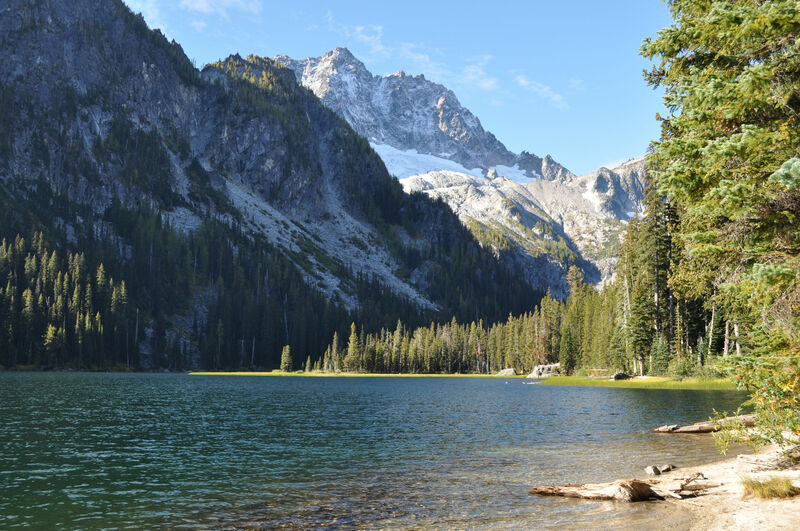 I purchased overnight camping passes for the Lake Stuart Zone in the Enchantments area of the Alpine Lakes Wilderness of Washington state. It’s due east of Seattle and north of Mt. Rainier. It takes me 4 1/2 hours just to get to the trailhead, but I can’t help myself: it is so beautiful there. Interstate 90 in Washington state, heading east of Seattle first thing in the morning Tuesday. 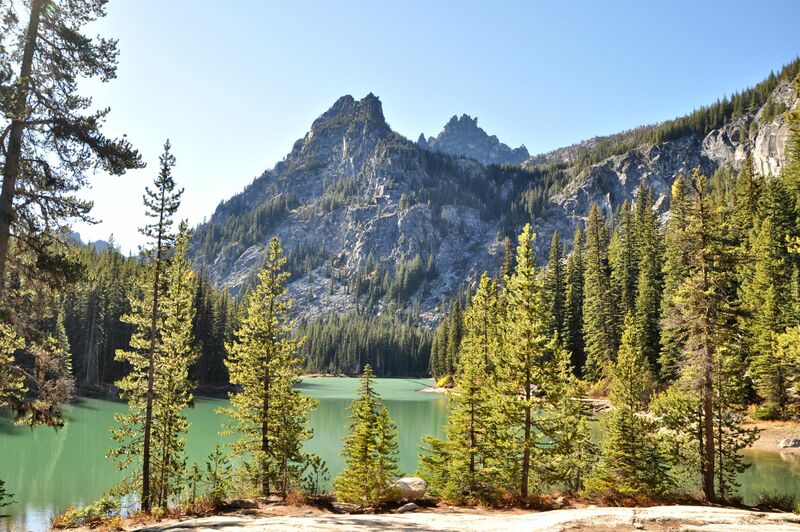 I’ve been through the Enchantments several times, and always from the Snow Lakes trail which approaches the Alpine Lakes from the east. It’s a long through trek, and I have never had the stamina to go all the way through to the lakes on the west side. This year I simply began on the west side! 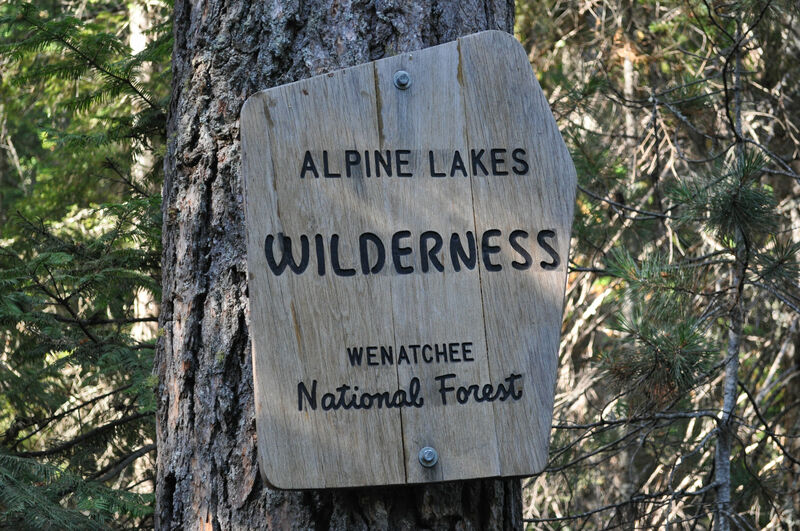 I think it is a nice touch that the U.S. Forest Service always makes these signs asymmetrical. At a fork in the trail, I saw signs that left me puzzled. 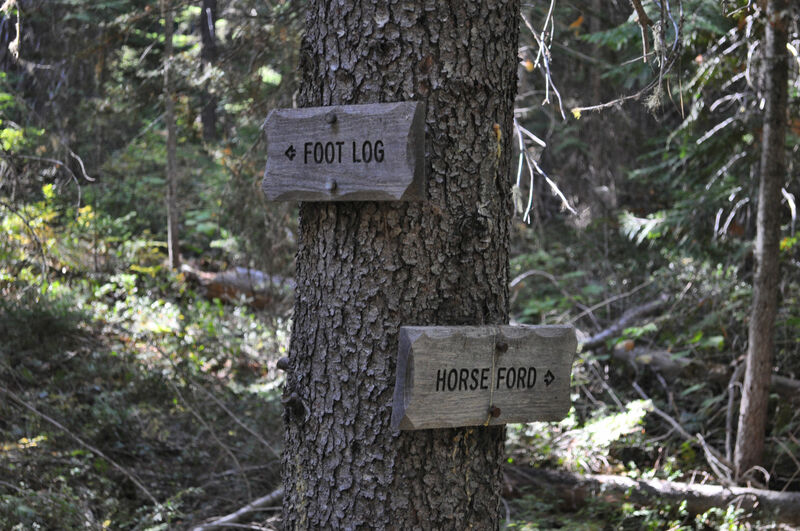 At first glance, “foot log” and “horse ford” sounded like landmarks I had never heard of. I had no idea what trail to take until I calmed down and took the words literally. A log for foot traffic, and a place for horses to ford. Viola! 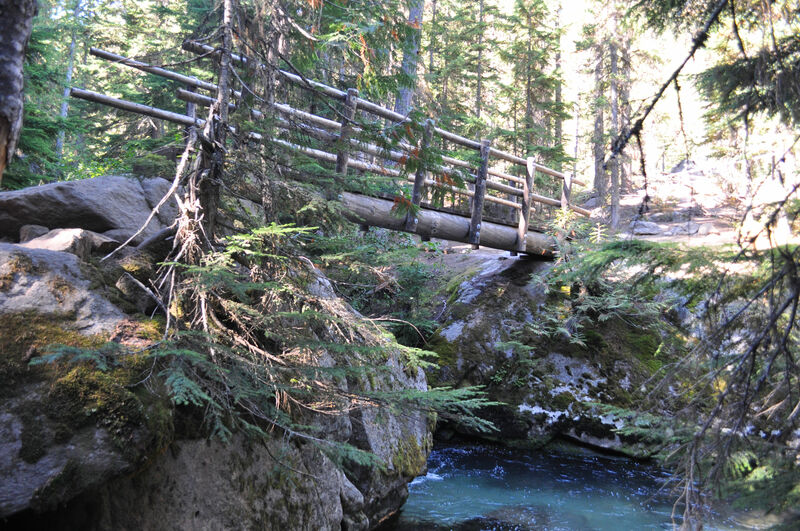 “foot log,” otherwise known as a log bridge for those traveling on human feet. 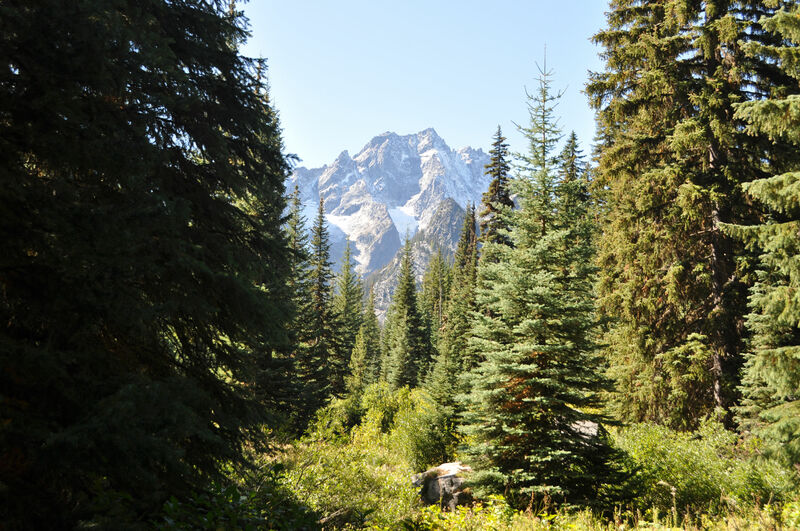 One lovely thing about the west side approach is that the Stuart/Colchuck trailhead is higher in elevation than the Snow Lakes trailhead, so I climbed the first 1000 feet (or more) in my Jeep. That was pretty sweet. 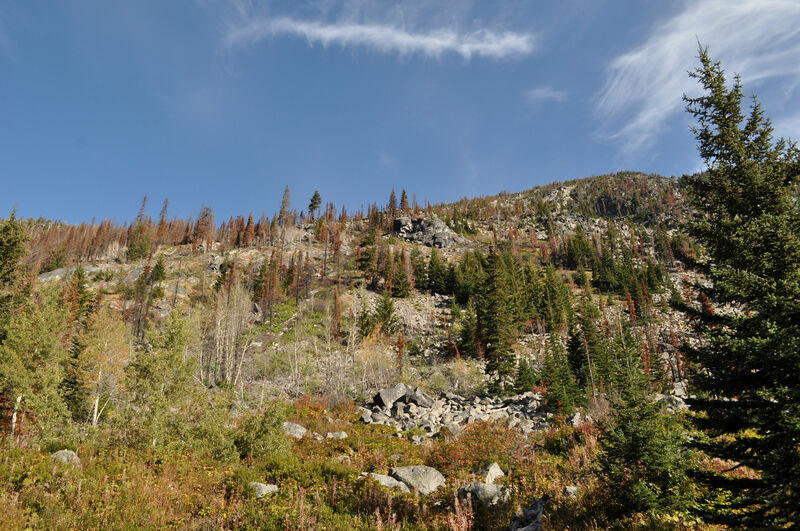 Once I began hiking, much of the trail was a rather gentle slope, and a couple of steep spots a few miles in. Nothing like the grueling switchbacks at the start of the Snow Lakes trail. 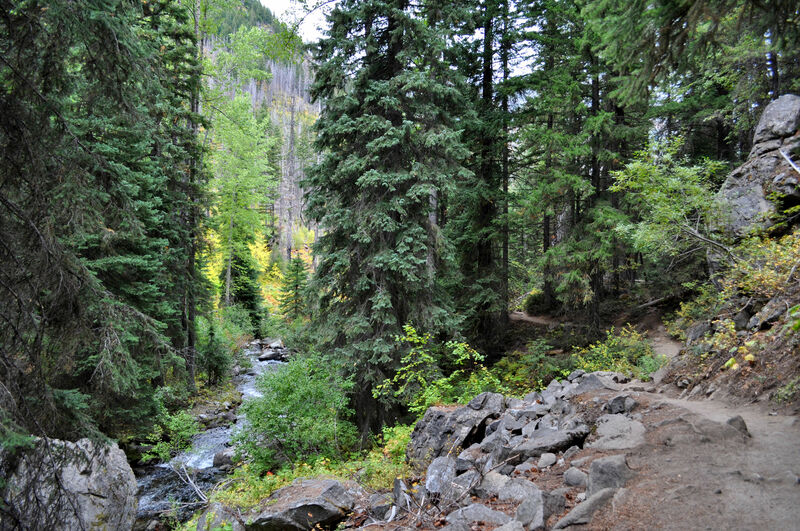 The trail beside Mountaineer Creek. 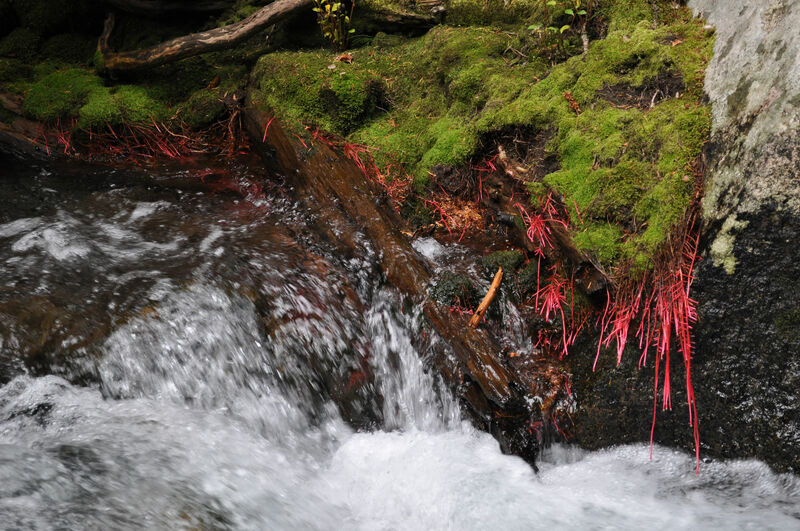 Look at these scrumptious red roots. Or branches. What are they? Gorgeous, that’s what. 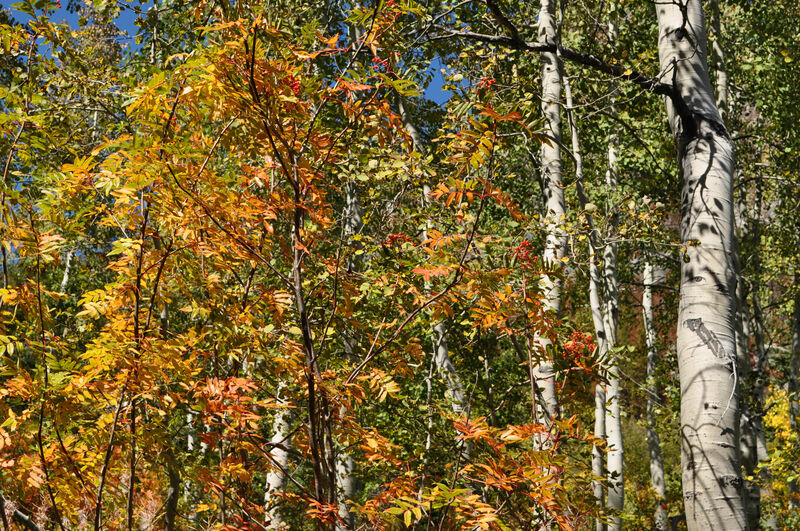 Autumn is the most glorious flamboyant season, don’t you think? 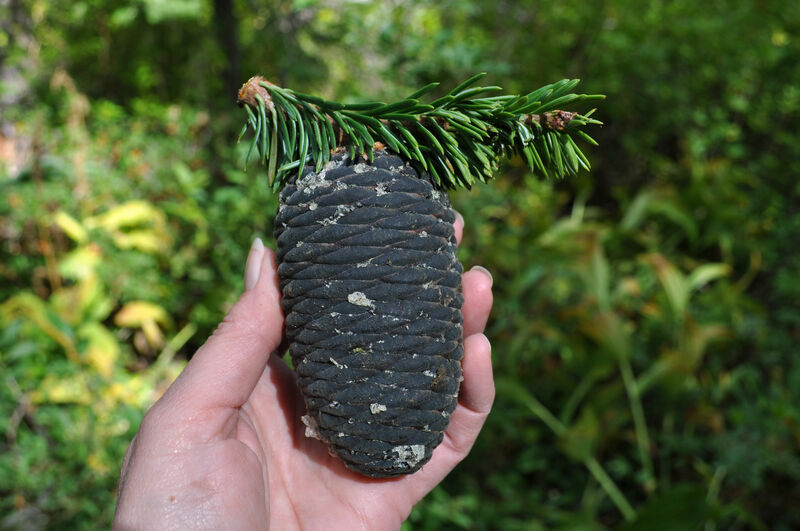 I saw several of these cones on the trail. I don’t think my photography captured it, but they are a deep dark purple. I’ve said before, my hike pace could best be described as “mosey.” I’m solid on the uphill stretches. Slow, but steady, I can just keep going up, up, up. But steady includes a lot of stops to look at all the waterfalls and pretty foliage and the squirrels and interesting pine cones. It feels good to be on a trail again. I have not hiked much the last couple of years. My theory is now that I live in the wilderness practically, I don’t have the driving need to escape people and hit a trail as much as I used to. In any case, however wild my own property may be, it’s nothing like truly being in the mountains. While pausing in a meadow with fireweed going to seed, a gust of wind came and filled the air with flying seed pods. Look closely, and you’ll spot the faeries. Finally! First glimpse of the mountains. These are exactly the moments I live for on the trail. I get tired, I wonder how far I’ve come, how far there is to go, whether I should stop and rest, and then…. I get a view of mountains. This inspires me. Another mile along the trail and blam! This, people. This is what it’s all about. My tanks are filled and I’m gushing. I met a bold, fat chipmunk that practically climbed onto me while begging for food. 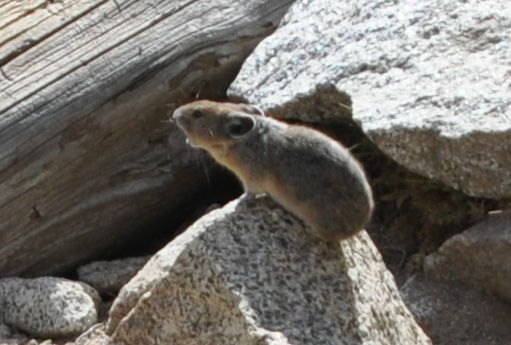 And this was a pika that might have been shy around me on another day, but this day rather had to get an urgent message to his buddy across the rock fall. Listen, when your hiking pace is “mosey,” it involves a lot of imagination. Suddenly I spotted a sign that said “No campfires beyond this point.” And I don’t know what crazy person ever starts campfires this time of year, but to me this sign means “the lake is pretty close.” And sure enough, only a little while later, the trees parted and there it was. 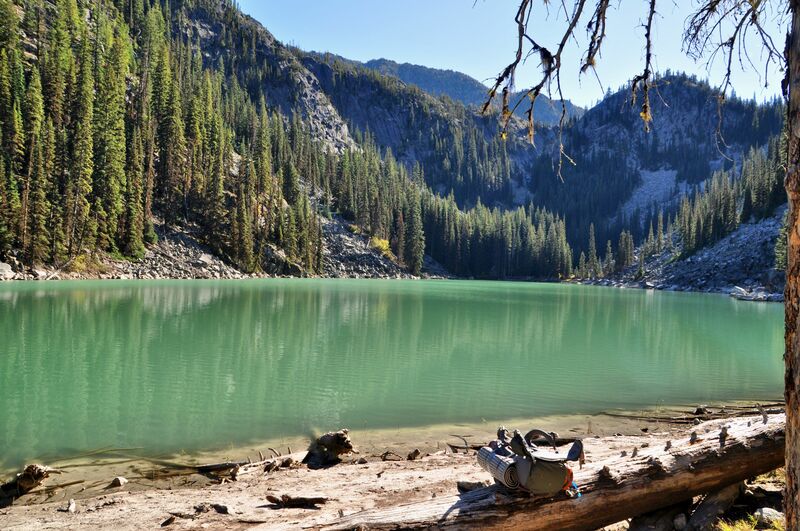 Only 4 1/2 miles along the trail, an elevation gain of 1665 feet, and I hit Lake Stuart. At the far end of the lake, looking back. 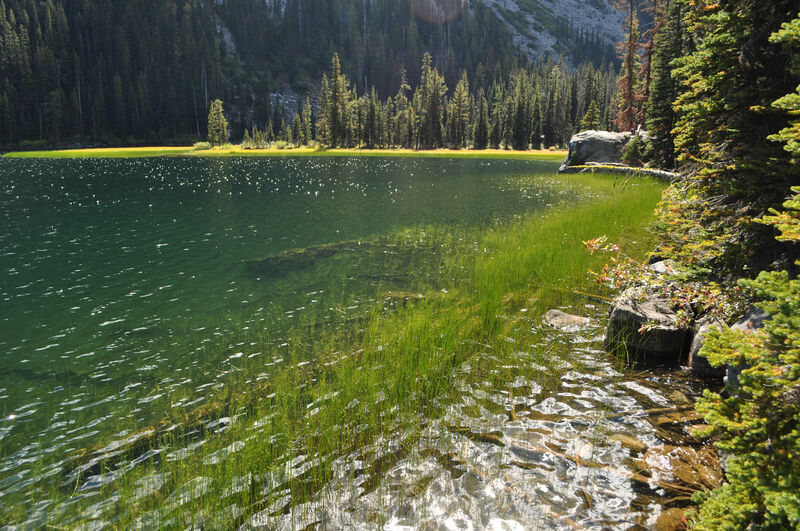 I love how the sun lights up those pale green grasses and horsetails in the water. Many spots were occupied, but when I found this lovely little beach, I knew it would be my home for the next couple of nights. Um, yep, that would be my campsite. Recurrent theme for camping in the PNW: always gorgeous campsites. I admit, I crashed early. You know with my exceptional gastronomic tastes, I always bring a pack filled with amazing food, which means: HEAV-VY! I get so wiped out when I have a full pack. For supper I mixed up the easiest thing on the menu, taco salad. Fresh chopped lettuce, corn chips, beans, tomatoes from the garden, green chilis, hominy, sour cream and salsa all stirred together. An obnoxious chipmunk came to raid my bowl while I left it on the beach and went to get the wine. I was impressed to see that the prize it chose was a big chunk of taco-spiced lettuce and not the chips! Though marijuana use is now legal in both Oregon and Washington… this is the high I’m after. Before I left, I told my neighbors I would be gone all week, and by way of explanation I said, “The reason I work is so that I can hike.” It’s only a small exaggeration. Aside from taking care of Tara, and having a house to call home base, the reason I have a job is so that I can save up vacation days and then pay for my play time. Two things top the list titled Play Time: 1) travel, 2) backpacking. 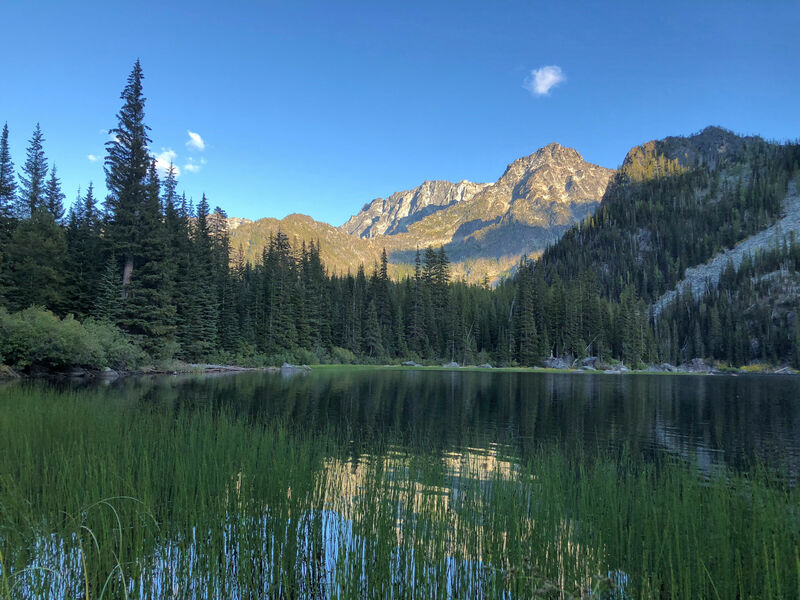 I reluctantly left my comfortable-as-a-cloud hotel mattress behind me in Leavenworth, Washington, ate breakfast at Kristall’s (with a name like that, I had to), and found the trailhead in 15 minutes. I was on the trail by 8:20 am and in no time I had left civilization well behind me. 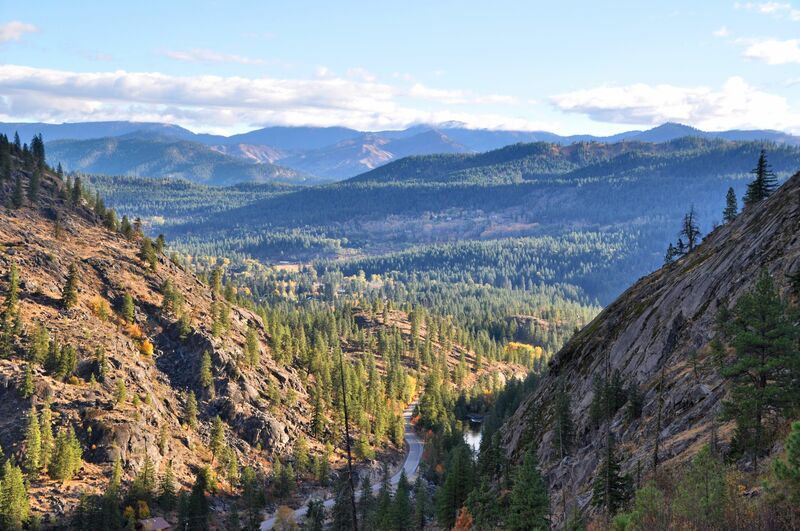 Looking from the first set of switchbacks toward the western edge of the town of Leavenworth, and the road to the trail head. 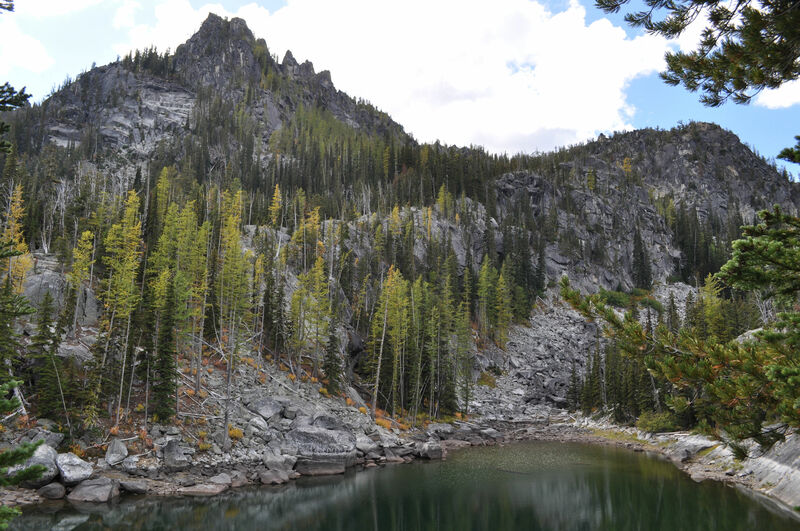 I climbed 3500 feet in elevation in about 5 1/2 miles to Nada Lake – the one you see pictured at the top. There were so many switchbacks climbing up and up and up. On this trip, unlike last year’s, my spirits were soaring, the weather was amazing, and the sights along the trail were constantly photo-worthy. Yes, it was a rough climb, and I was tired, but not discouraged at all. 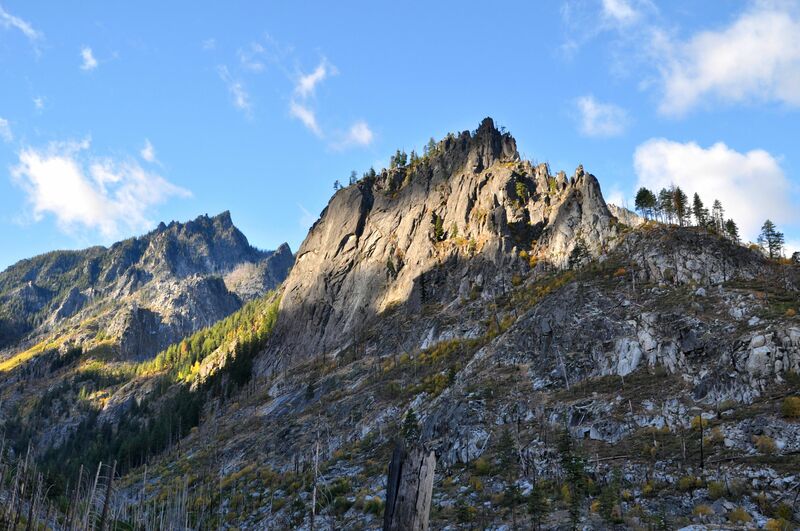 This is called the Snow Creek Wall, and is popular with rock climbers. On my way up, and back down, I looked carefully, but did not see any climbers on the wall itself, though I did see climbers making their way through the valley back to the trail. 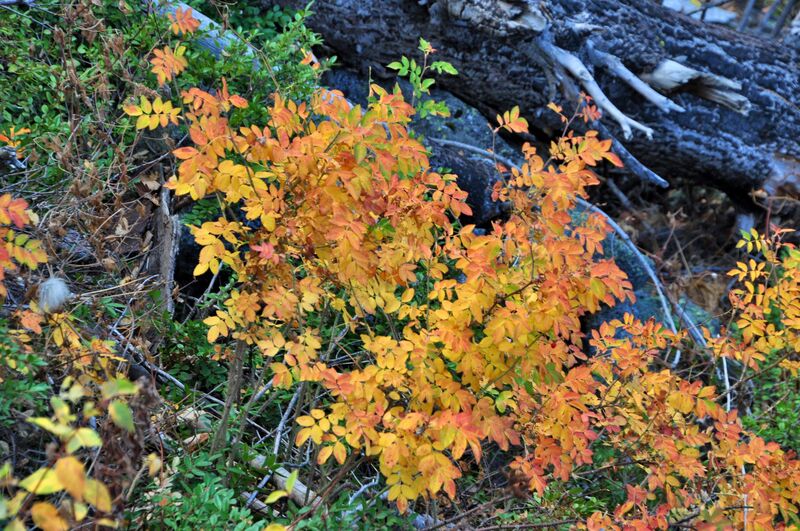 Funny thing about the higher elevations: Spring comes so late that Fall overtakes her. 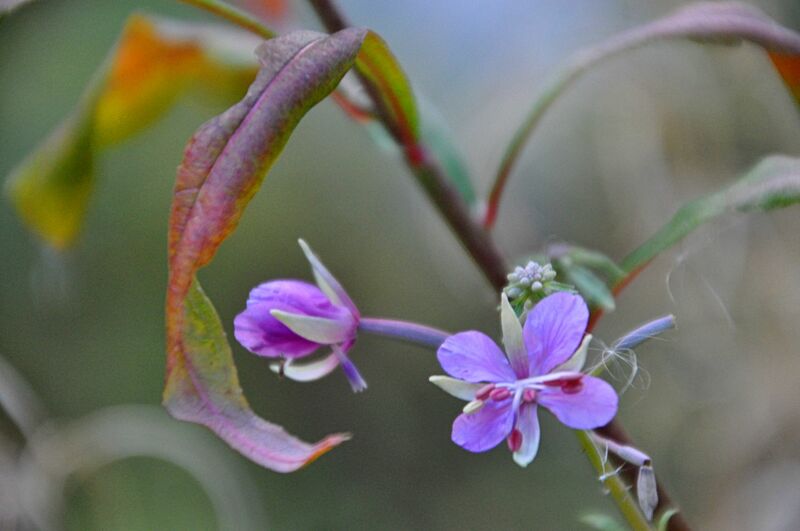 Here fireweed continues to bloom, while Autumn turns the leaves orange. 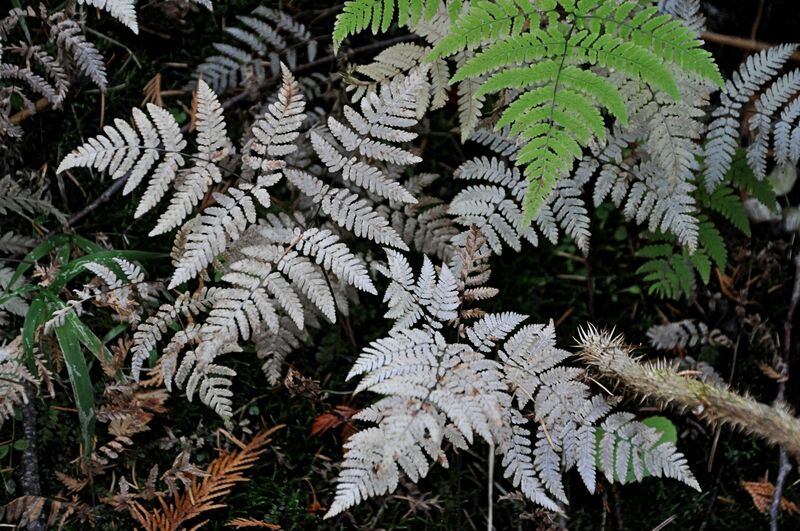 These bleached white ferns caught my eye. What month is it? It’s the month for oranges and reds and yellows! 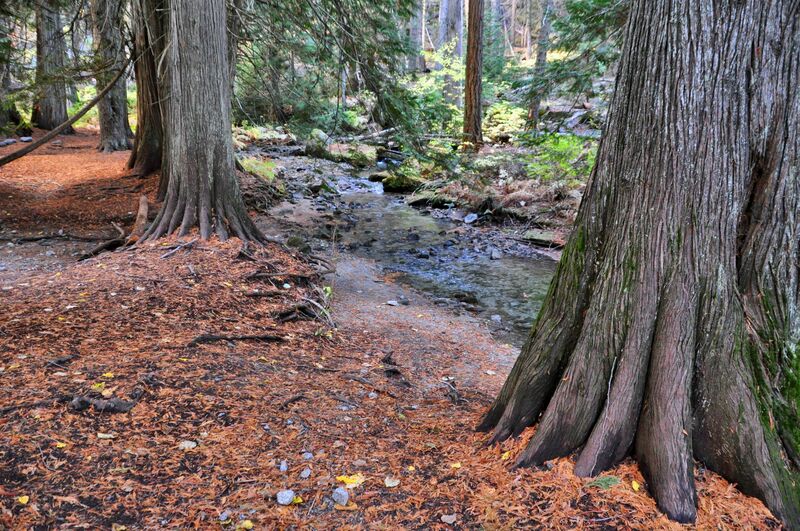 Cedar trees reach their fingers out to soak up a bit of Snow Creek. 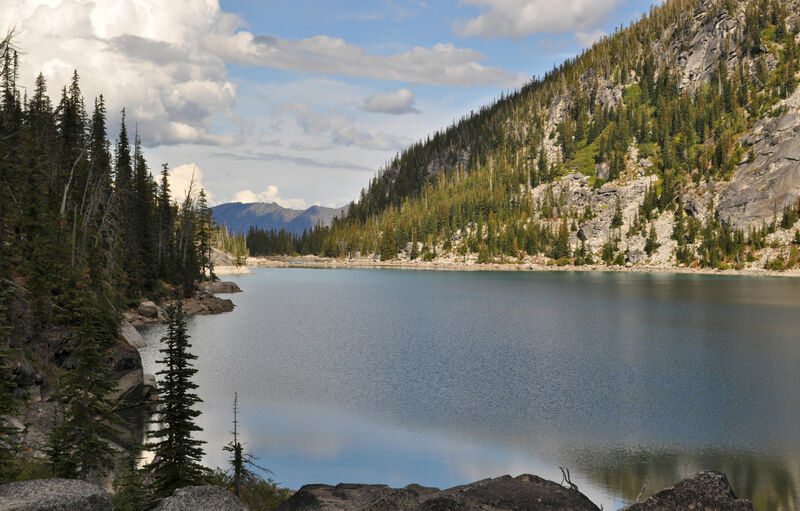 I gave myself a break and stayed the first night at Nada Lake. I have not been able to hike all year, and I also have not been exercising regularly. I wanted to be smart about this and save some reserves for the days ahead, since pushing too hard out of day-one-excitement can lead to injuries. For my campsite I chose a cute little peninsula that I assume is usually below water, based on the signs of lake level around the shores. It’s the end of the season, which means water levels are at their lowest. 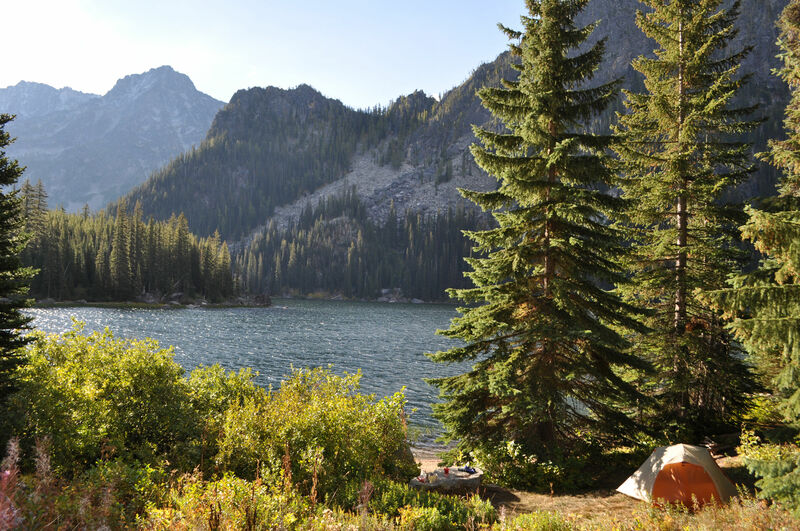 As soon as I spotted this peninsula jutting into Nada Lake, I knew I wanted to camp there. 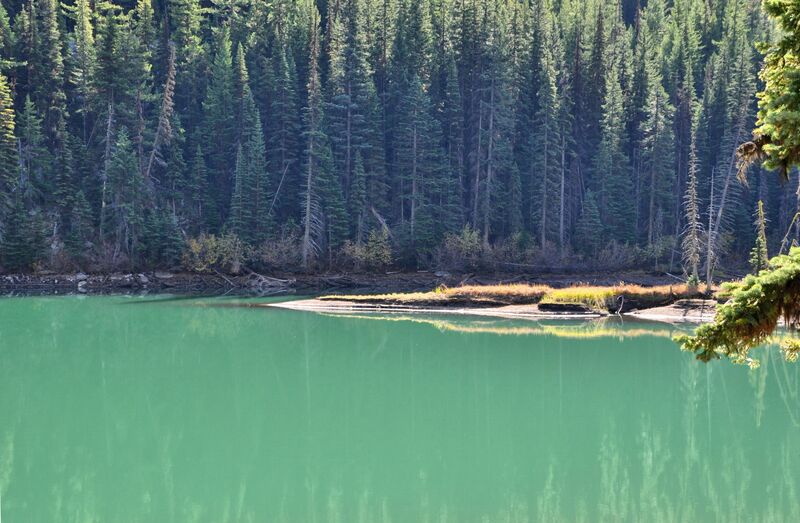 Look at the incredible aqua blue of this lake – isn’t it remarkable? While searching for a way to get to the peninsula, I took off my pack and gazed up at the far end of Nada Lake. Look at my pack there, on her back with her legs curled above her like a dead beetle. Home Sweet Home. It was as splendid as I imagined it. Who needs a designated camp site? 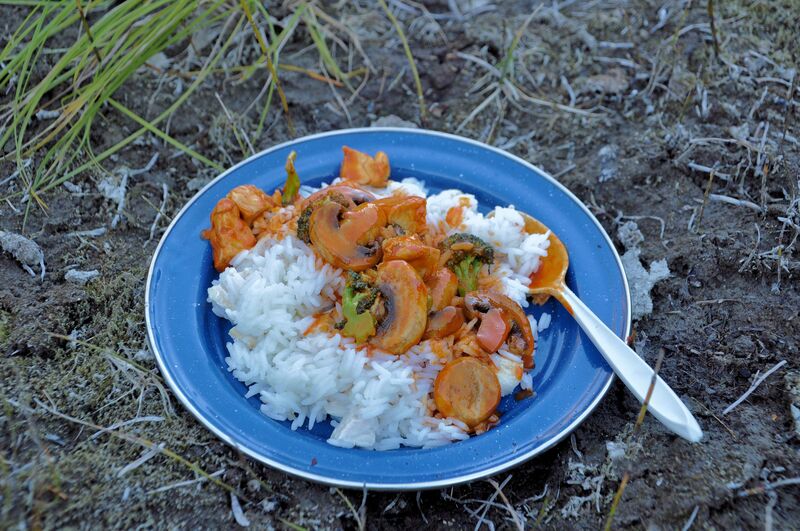 I had loads of late afternoon sunshine, so I took my time and cooked up a nice meal for an early supper. I’ve mentioned before that I eat well when I’m camping. The down side is that my food weight is higher than most reasonable back packers. The up side is that… well… I eat really well! And, I always carry wine with me, because one must celebrate her accomplishments, and I like to celebrate with wine. My supplies for my first supper: Thai curry (yes, I used coconut milk) with chicken, fresh broccoli and mushrooms. There are apricots in the photo too, but I did not use them. Wednesday night I had pasta with alfredo sauce, sausage, and sundried tomatoes. I did not bring milk for the alfredo, but with powdered milk, real butter and pre-grated parmesan, that sauce was mouth-watering despite being made with lake water. 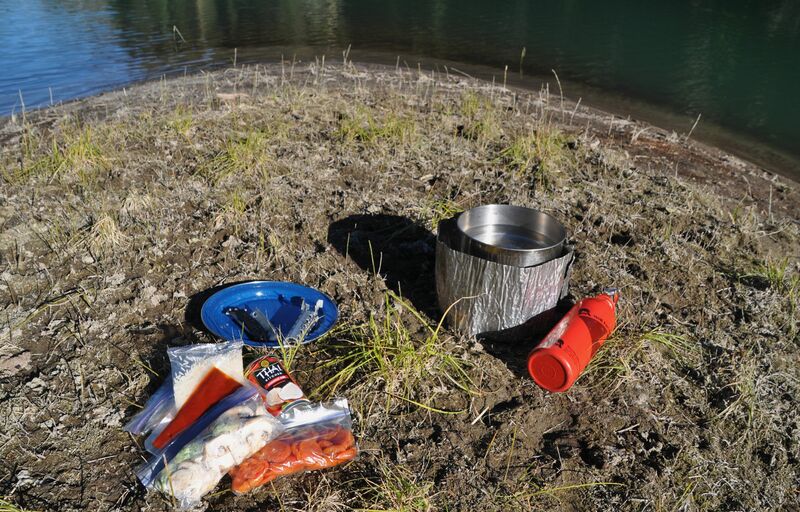 I use a lot of water camping, and I just boil all the nasties out of it, so it’s safe. In 15 years of back packing, I have not yet been sick from the water, so I’m pretty sure I’m doing it right. I had originally intended to make the alfredo and pasta with chicken, but I was not in the mood for chicken on a second night and opted for sausage instead. Thursday night I had burritos with rice, refried beans, pre-sauteed onions, cheese, salsa and fresh avocado. There are no photos because I got back to camp late and ate in the dark. 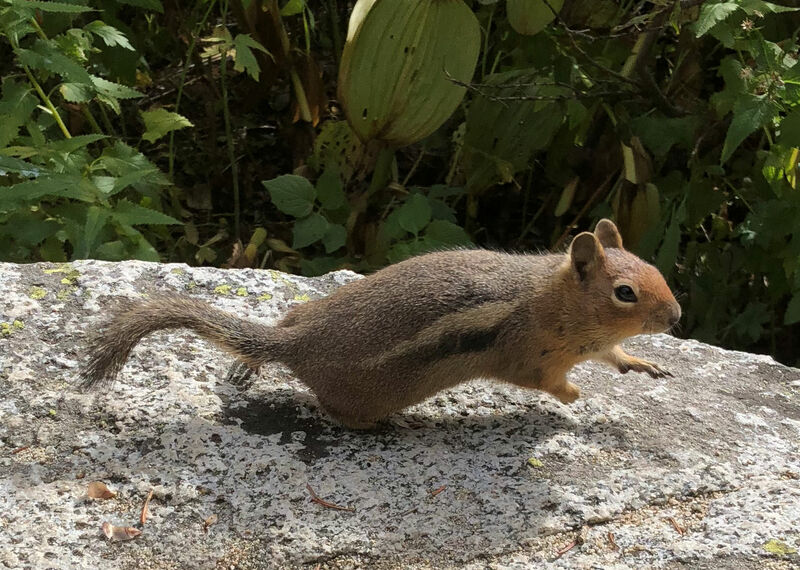 I discovered that chipmunks love avocado, when I accidentally left one half of the shell outside by the camp stove overnight, and in the morning found it spotlessly clean with teensy tinsy teeth marks all over it. The avocado trick I learned from back packing mentor M, who took me on my very first trip ever, in 2000. M showed me that if you pick a rock-hard avocado in the store, and carry it for a few days in your pack, it’s perfect! Before I left I baked cookies packed with things from the pantry: chocolate chips, dried cranberries, oatmeal and walnuts. I also boiled eggs. 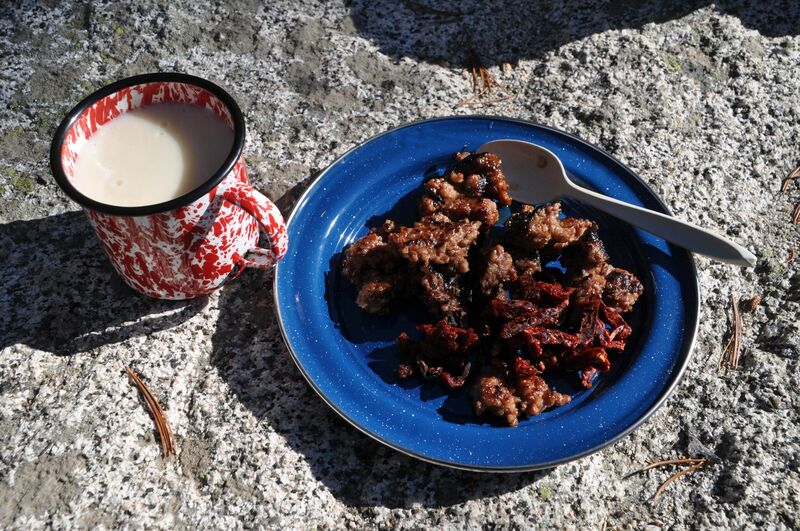 So several breakfasts were hardboiled eggs and cookies and coffee. I always bring Peets coffee (my fave brand). 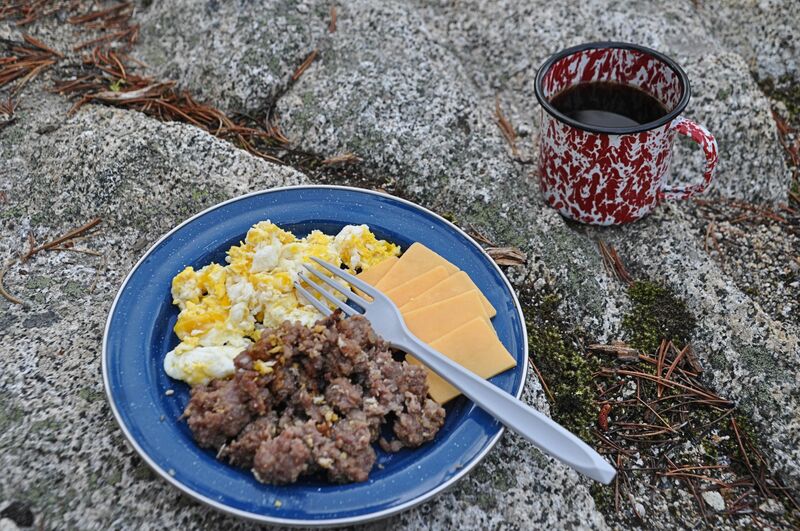 One morning I had sausage and scrambled eggs from real eggs that I carried. Unfortunately the container I chose to store the eggs were not leakproof, and for the rest of the trip I had a bit of raw egg on the packaging of my other food items. Ah well. I typically melt the Tillamook cheese over the eggs, but it was 34 degrees that morning and the heat would not have been maintained long enough to melt the cheese. I had to scarf it down while the eggs were still warm. A word on dishes. The blue plate came along not simply because the cobalt blue enamel is lovely and makes my food taste better. The plate is perfectly sized as a lid for both the deeper pot, and the shallower pan that I brought. The pot is for boiling water mainly, but having multiple dishes allows me to store one cooked item while cooking the second item. You can see my entire dish selection below: one pot, one pan, one plate, one cup, one fork, one spoon. I also bring one sharp knife that can be used for food as well as for cutting rope or branches as needed. Cleaning dishes in the mountains is an endeavor. First of all I try to avoid using soap if at all possible. It is good for killing bacteria and thus is not good for the environment. Scoop a little stream or lake water into your dish, and add a handful of sand. Use your hands to scour, then dump the dirty water well away from the shore. Since it was so bitterly cold in the evenings and mornings on this trip, I was forced to heat the water to make that process effective. Using sand is amazingly effective. You won’t believe it till you try it. The two meals with sausage, I had to use Dr. Bronner’s soap because of all the fat left behind. You want to use the mildest, most quickly biodegradable soap you can bring, and always dump the water well away from the shore, and not onto plants. Alright, that’s my public service message for the day. Tune in next time for the rest of the trip! Alfredo sauce, sausage, sundried tomatoes. The final meal. The pasta has a dark colour because I boiled it in the same pan in which I cooked the sausage. That made the water brown, but oh so flavourful. Roughing it? Says who? I do breakfasts too. Here you see the remainder of the sausage, scrambled eggs, sliced cheese and coffee (in the coffee/wine/alfredo all-purpose tin cup).